● Started 13th and finished ninth. 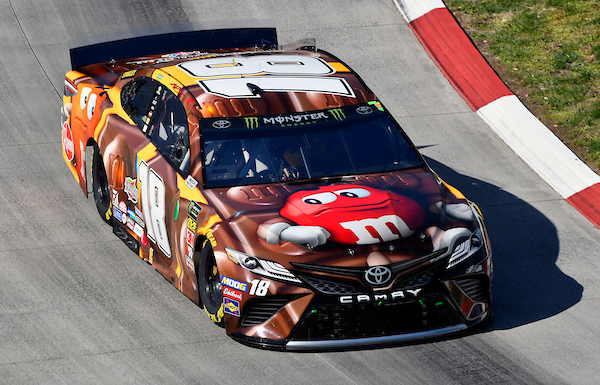 ● The M&M’S Chocolate Bar Toyota driver exercised a patient pace during the opening laps of the STP 500. He made the top-10 by lap 15 and started logging laps after reporting that the car was handling on the loose side. ● Caution was displayed on lap 64. The M&M’S Chocolate Bar team made an air pressure adjustment, changed four tires and added fuel. Busch restarted the race in 10th place. ● The adjustments helped improve the car’s handling but not to the extent Busch needed to be able to make passes in green-flag race conditions. As such, Busch leveraged restarts to make up track position. ● Busch finished the first stage in ninth place. During the caution, the team made an air pressure and wedge adjustment, changed four tires and added fuel. Quick pit work placed Busch in seventh place for the start of Stage 2. ● Started seventh and finished 12th. ● After an early caution on lap 146, the second stage continued with a long, green-flag run that would continue to the conclusion of the stage. That proved a little problematic for the No. 18 M&M’S Chocolate Bar team as the handling deteriorated the longer the run continued. ● Busch reported on lap 215 that the right rear was an issue and that he needed the team to go back on some of the changes they had made at the conclusion of Stage 1. ● The 2015 NASCAR champion managed the car without issue and finished Stage 2 in 12th place. ● The team made a series of adjustments, and quick pit work placed Busch in seventh place to start the third and final stage. ● Started seventh and finished third. ● Busch leveraged the restart to pick up a couple of positions, running in fifth place by lap 274 and in fourth by lap 289. He quickly reported that the changes were effective and he would like the team to go in the same direction on his next stop. ● Caution was displayed on lap 312, and the team continued to make adjustments to the No. 18 M&M’S Chocolate Bar Toyota. Quick pit work placed Busch in third place for the restart. ● Busch continued to report on the car’s handling as the run continued, noting that the No. 18 started off handling on the loose side but would start to get tight at different points on the track. Another caution on lap 371 allowed the team to make another round of minor adjustments. Once again Busch came off pit road in third place for the restart. ● While the handling was not perfect, it reached a point that allowed Busch to be more aggressive on the track. He raced as high as second place before eventually settling in at the third position, which he maintained to the conclusion of the race. ● Busch’s third-place finish is his fourth straight top-three result. ● Busch now has two wins, five top-fives and six top-10s in the 2019 NASCAR season. ● This marks his 16th top-five and 17th top-10 in 28 career starts at Martinsville. Next Up: The next event on the Monster Energy NASCAR Cup Series schedule is the O’Reilly Auto Parts 500 on Sunday, March 31 at Texas Motor Speedway in Fort Worth. The race starts at 3 p.m. EDT with live coverage provided by FOX.